When the technology of photography arrived in the Middle East and the Holy Land, for the first time Western viewers came into contact with and beheld realistic and scientifically accurate images of archaeological and pilgrimage sites that had stirred Western religious imagination for centuries. 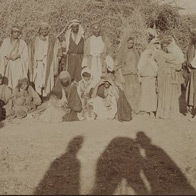 Nearly absent from these images were the people of the Holy Land, who often appeared as small and blurred figures or as extras, carefully placed and posed by photographers to enhance the desired effects of their still subjects. With the introduction of portraiture and early street photography, the people of the Holy Land later became subjects in their own right, yet their modes of representation largely remained tied to common Oriental and religious themes. The exhibition focuses on these modes of representation. It presents the role of people in nineteenth-century Holy Land photography and the ways in which their visual representations met or challenged nineteenth-century conventions about the Holy Land. It also brings back to life the faces of local inhabitants otherwise lost to history. The images on display here come from the extraordinary Lenkin Family Collection of Photography at the Penn Libraries. During its 2017-2018 fellowship year, scholars at the Herbert D. Katz Center for Advanced Judaic Studies asked new questions about how the history of science, medicine and technology may be seen from the perspective of Jewish culture. Among the highlights featured in this web exhibition are studies of ecology and the environment, astronomical science; calendrical systems; geographical knowledge; medieval and early modern natural philosophy; the history of medicine; evolutionary biology; Spiritualism; contemporary research in genetics; as well as modern industrial technology. Over the course of their history, Jews have embraced a wide range of ideological views and operated within a variety of political contexts. These experiences have generated a rich body of political thought, but there has been an ongoing need to advance such thought in light of new developments in political theory and a changing world beyond academia. One way forward is to continue to stretch the boundaries of Jewish political thought in ways that intersect with the study of law, religion, history, literature, and other subjects, or that approach the subject in a comparative framework. During the 2016-2017 academic year, The Katz Center brought together scholars working in fields from ancient to contemporary philosophy and theory to unsettle regnant paradigms of power and statehood. They drew upon a wide variety of sources and interdisciplinary methodologies to challenge established understandings of Jewish political history. Focusing on the experiential, the sensual, as well as philosophical and theological reflections that occur within and beyond the rational dimension of human life, our scholars showed how emotions like love, anger, anxiety, joy, fear, empathy, sympathy, sadness, desire, pain, and pleasure—though rooted in neurological and physical responses—are shaped by culture. Among the questions they posed are: How are we to explore and better understand emotions in Jewish cultural and political contexts? Are there distinctively Jewish aspects of universal human experiences of sensation - sight, sound, touch, or scent? What does Jewish thought have to say about the non-rational dimensions of Jewish philosophy and embodied spirituality beyond reason? Discussions of experiences of suffering, bereavement, distrust, art, architecture, photography, sexual desire, Jewish thought, ethics (musar), law (halakhah), psychoanalysis, trauma and culture, and New Age Judaism in the modern State of Israel, all form part of this year's exhibition. From its inception, Jewish studies was a transnational endeavor characterized by a network of scholars emerging from different seedbeds. In time, modern rabbinical seminaries in central Europe and universities in France, England, the US and Israel would provide new and necessary forms of institutionalization. The needs and strategies of the discipline and its political and cultural functions varied in different countries and political contexts. The turn to history in the 19th century fundamentally recast the nature of Jewish thinking in Europe and beyond, influencing even those who challenged or rejected the dominance and mandate of historical-critical scholarship. The predominant narrative in this history of the academic study of Jews and Judaism is that of the Wissenschaft des Judentums (WdJ), which fulfilled crucial cultural, political, and religious functions in its day, and which, despite recent scholarship, remains to be fully contextualized. This past year's Fellows explored critical questions about how academic categories and methodologies have framed how Jews and Judaism are understoodbe they in parallel with Christian theology, political science, history, classical philology, or in relation to traditional learning contexts. In this exhibition, we find examples of the fruits of their intellectual labors in reconstructing the history of the academic study of Judaism from these early, diverse seedbeds. A discrete historical period called "Early Modern" has long been identified by scholars working in a variety of disciplines to characterize the 15th-18th centuries in European history. Only in recent years have historians adopted this time frame to explore and define the specific cultural experience of Jews in Europe and the Mediterranean Basin. This past year's research group came together to bridge often disconnected areas of scholarship and to probe the meaning of an early modern era of Jewish history on its own terms. Borders and boundaries were understood geographically, but also as social, cultural, legal, political, and economic realities. Recognizing these connected histories helped us understand the internal divisions and new cultural movements and practices within Jewish society; careful study also revealed unexpected new relationships among Jews and non-Jews. In this year's web exhibition, we highlight the boundary as both a dividing line and a place of meeting and mixing between different groups (Jewish and non-Jewish) in an attempt to shed light on the nature of early modern Jewry and the early modern period in general. The monotheistic cultures of Judaism, Christianity and Islam during the Middle Ages have too often been studied in isolation from one another, with notable exceptions focused on the contacts that occurred at the point of the sword. Developing a more integrated picture of the complex, entangled relationships that bound together Latin and Eastern Christianity with Islamic Africa and Asia during the 13th Century C.E. and the position of Jews living in and between these geo-cultural zones, was the challenge taken up by the 2012-13 post-graduate Fellows at the Herbert D. Katz Center for Advanced Judaic Studies at Penn. The Fellows studied diverse phenomena such as the creation of new philosophic and scientific cultures, the emergence of medieval halakhah (Jewish legal praxis), the diffusion of Kabbalah, the establishment of new mendicant orders, the institutionalization of Sufi brotherhoods, the rise of universities, and the role of inquisitors. They were studied not only as isolated phenomena but in their mutual interrelations. This online exhibition, entitled "13th Century Entanglements: Judaism, Christianity, & Islam" features a number of original sources that were draw upon by these scholars in the course of their research: Hebrew, Latin and Arabic manuscripts and early printed texts which illustrate a range of topics such as medieval liturgical poetry, law, rhetoric, philosophy, science, magic, social history, gender relations, inter-communal contact, conflict and other forms of entanglement both positive and negative. The subject of travel and its complex range of practices and representations has provoked intense scholarly interest in recent years. Historically, Jewish travel has taken on many forms and is documented in a wide array of primary sources: medieval Jewish merchant records; legends of the Wandering Jew; travel itineraries, real and imagined; accounts of pilgrims to the Holy Land; early sixteenth-century Hebrew manuscript reports of the discovery of America. Notably, the subject of Jewish virtual travel by photograph or postal exchange, through journalistic reportage, motion picture footage, postcard images of the exotic as well as contemporary tourism to Israel also has attracted scholarly attention. What cultural and ideological work is performed by these texts and what kinds of images of self and other are generated through them? These are some of the complex themes and challenges that the 2011-12 Katz Fellows addressed, a sampling of which are on display in this year's web exhibit. "Taking Turns" takes as its starting point the idea of converts and conversion - an unstable subject, in the double sense of a topic very much in need of definition, and a model of individual and group life that does not presume a fixed or univocal "identity." Through the study of conversion, our understanding of the very meaning of "Judaic," "Christian," and "Islamic" identities has been complicated and even transformed. HAS RELIGION DISAPPEARED or been banished from the public sphere, as some adepts of classic secularization theory once thought it might? Both anecdotal and empirical evidence point quite decisively to the opposite conclusion. Indeed, religion appears to be more resurgent and present in the public square today than at any time in the modern age. And yet, to deny that religion has not been transformed by its encounter with the modern public sphere, state, and economic order would be foolhardy. The Fellows of the Katz Center for Advanced Judaic Studies during the 2009-10 year devoted themselves to studying the complex interplay and often permeable boundary between the religious and the secular in modern Jewish history. JEWISH ECONOMIC HISTORY is both understudied and overrated. This paradox is not hard to explain: Jews' historically disproportionate role in commerce and finance has been a source of embarrassed silence for some scholars and eager exaggeration for others, largely depending on one's attitude to capitalism and readiness to associate it prominently with Jews. The Katz Center devoted the past year to this complex subject of "Jews, Commerce, and Culture." The emphasis on "commerce" aimed to defuse apologetics by confronting the most controversial feature of the Jews' economic past head on. Here the overarching question was whether and how commerce can serve as a useful category for linking local Jewish communities and events across a wide geographical and chronological expanse. At the same time, the prominence in the title given to "culture" was meant to underscore the truth that economics is not solely materialist and quantitative in nature but is rather an integral part of the larger fabric of Jewish religion and folkways. JUDAISM WAS BUT ONE SMALL PIECE of the Roman imperial context. How does this perspective change the sort of evidence and questions we bring to this era of seminal transformation in Jewish culture, law, society, art, and practice? How can Roman history be pushed to take the measure of the vast, but often inaccessible, evidence of one of its own (uniquely vocal) provincial populations - the Jews. How did the Christianization of the Roman empire re-define Jewish-Christian relations and communal boundaries? In this exhibit, scholars of late antiquity grapple with the complex and multifarious material sources and received texts upon which are understanding of the Roman empire and its minorities is built. WHEN ISLAM appeared in the Near East in the mid-seventh century CE, this new monotheistic faith was not only a spiritual movement, but also a political power. Soon after its emergence, Islam changed the map of the entire Mediterranean basin and beyond - as far as the gates of India. The most prominent Jewish communities in the early Middle Ages lived under Muslim rule. Politically and legally they were treated as a minority, as were the Christians, who in the first centuries of Islam actually constituted a numerical majority in many areas. Soon after being integrated politically into the realm of Islam most of these Jewish communities gradually integrated into the Arabic culture. Within this broad framework evolved Judeo-Arabic culture. The period between the 7th and the 11th century could be justly defined as formative for both societies – the Muslim one was actually shaped in this period, and the presence of the majority of Jewish population worldwide under Islam modified Jewish life profoundly. THE HISTORY OF MATERIAL TEXTS, from wax tablets and parchment scrolls to flat screen laptops and DVDs, has entered the academic mainstream over the last half-century. How have the materiality and formatting of texts from antiquity to the present shaped authorship, transmission, reception, and interpretation? How have the business of Jewish book production and the market forces of book consumption affected Jewish life and culture? How have the visual art and design of Jewish books shaped reading habits, legibility, recollection, and signification? How have cultures of Jewish reading changed over time, creating new forms of social experience and testing communal authority as well as gender boundaries? What has been the fate of Jewish books, libraries, book producers, publishers, and readers, under conditions of censorship and persecution? During the 2005-06 academic year, the Fellows at CAJS explored the Jewish book as an historical agent in Jewish culture and as a medium of exchange within the larger cultures in which Jews have lived. Their work drew upon a variety of inter-disciplinary perspectives, with the aim of uniting scholars working in the traditional fields of Jewish studies with scholars of the history of the book. BOOK PRODUCTION is a business as well as a craft, a trade and an art form. Since the invention of moveable type in the fifteenth century, Jews as well as non-Jews have been engaged in the printing and sale of a surprisingly diverse array of editions of Judaica. This exhibition offers a small sampling of that vast panoply of creativity, based on the University of Pennsylvania’s distinguished library collections at the Center for Advanced Judaic Studies and at the Walter and Lenore Annenberg Rare Book and Manuscript Library. The materials selected highlight not only the production but also the consumption side of the business of the Jewish book: who bought and sold printed Judaica. In this exhibit, you will see in particular how these precious books came to be part of Penn’s library collections. Each item label explains from whom books were purchased or who donated specific treasures, and otherwise documents how Penn continues to develop one of world’s largest and most important Judaica collections. The Fall Of 2003 marked the 100th anniversary of the publication of the first major English-language dictionary of rabbinic literature: A Dictionary of the Targumim, the Talmud Babli, and Yerushalmi, and the Midrashic Literature … With an Index of Scriptural Quotations, compiled by Marcus Jastrow, a Philadelphia rabbi and a University of Pennsylvania honorary Doctor of Literature. Jastrow dedicated his dictionary to his wife Bertha Wolfsohn, with whom he had seven children, including their son Morris Jastrow, one of the founders of Religious Studies in the United States, professor of ancient Semitic languages and Penn’s University Librarian from 1898 until his death in 1921. Marcus Jastrow died in Germantown, Pennsylvania on October 13, 1903. This exhibit at Penn fittingly celebrates the anniversary of Jastrow’s dictionary and honors the centenary of its creator for his contributions to the distinguished tradition of rabbinic learning and lexicography. JEWISH LITERATURE IN THE MODERN AGE reflects enormous diversity. On the one hand, there are literatures in Jewish languages, principally Hebrew, Yiddish and Ladino. On the other, there are Jewish literatures in Russian, German, French, Arabic, English and many other vernacular languages. American Jewish literature, while belonging to the latter category, seems to delimit a sphere of its own reflecting, especially in recent decades, the "difference" of American Jewry. We examined with great interest how in each of these cases the choice of the linguistic medium determines the intended audience and in turn affects the message about Jewish identity and culture. In all instances, we saw literature as a site of intense struggle around the question of Jewishness and modernity in which all the resources of the linguistic imagination were called into play to negotiate the passage from traditional society to contemporary life. What, then, is Jewish literature? Is it one or many? Are there viable criteria for determining what lies within and without the bounds of Jewish literature? These questions, perhaps in the end unanswerable, do not cease to engage us. WHAT IS THE DIFFERENCE between the way religious traditions instruct people to live their lives and the way people go about living them? This tension is explored in this exhibit by scholars of Jewish history and anthropology. Their dynamic approaches to the study of Jewish culture(s) challenge traditional disciplinary boundaries and demonstrate the diversity of Jewish life across time and space. These scholars also challenge assumptions about a normative Judaism and thus their research reveals the multiplicity of Jewish lives and traditions. Among the examples presented here are Jewish mystical and magical practices, Sephardic saint veneration, Karaite and Rabbinic rituals, as well as contemporary expressions of Jewish life through Renewal or Nationalism. EASTERN EUROPE WAS HOME to the greatest living reservoir of Jewish civilization in the world for over three centuries. From among the ranks of East European Jews emerged many of the key religious, intellectual, artistic, and political currents that shaped Jewish life across the modern period. Over the course of the last two decades, the historic Jewish communities that once covered the broad swathe of territory between the Baltic and the Black Seas have moved to the center of the study of the modern Jewish experience. Fueled by unprecedented access to long-hidden archival riches in the former Soviet bloc, a new generation of scholars has carved out fresh questions and new arenas of inquiry. JUDAISM, CHRISTIANITY AND ISLAM are all peoples of "the book," that is, Scripture believed to be the revealed word of God. What defines each of these religious cultures, however, is not only their common heritage in the Biblical past but the distinctive traditions that each of them has developed for interpreting the Bible and what they believed to be its message and meaning. Indeed, it is the different ways in which they have interpreted the Bible that have decisively shaped the development of Judaism, Christianity, and Islam. And all too often, perhaps, their different understandings of the Bible have also determined and complicated the tangled relations of these religious communities with each other. JEWISH ARTISTS have been respected contributors to modern music, film, theater, and visual art, and their activities encompass high art, mass media, and popular culture forms. But what is "Jewish Art?" Any art produced by Jews? Any art with Jewish content? Is there a distinctive Jewish style? Most of these questions presume standards set by conventional cultural histories, which despite universalizing goals, define the arts in national terms. Does that mean, then, that Jewish art is exclusively made in Israel, the modern Jewish state, or does it also describe art made by Jews in the Diaspora? CHRISTIAN HEBRAISM was an offshoot of Renaissance humanism whose devotees--biblical scholars, theologians, lawyers, physicians, scientists, philosophers, and teachers in Latin schools--borrowed and adapted texts, literary forms, and ideas from Jewish scholarship and tradition to meet Christian cultural and religious needs. Intellectual and cultural exchange did occur between Jew and Christian during the Middle Ages, but paled by comparison with what occurred between 1450 and 1750. Encounters between cultures can be fruitful, but also very painful. Certainly Christian Hebraism had such effects both upon European Jewry, and upon western tradition. THE TRANSMISSION OF JUDAISM has always been heavily dependent on written texts as well as the oral traditions surrounding them. One way to examine this process is by analyzing the various formats of Jewish texts in order to try to understand how they may have been read. At two points in history the Jewish book has undergone fundamental transformations from scroll to codex in the eighth and ninth centuries, and from manuscript to print in the early modern period. It is this latter transformation that this exhibit will examine by focusing on the impact of printing on the format of the Jewish book and, by extension, on the Jewish cultural and religious experience. Historians of general European culture have noted the importance of the printed book for the dissemination of knowledge to a wider audience and for shaping the ways in which texts were read and ideas were digested. In the study of Jewish culture, several scholars have noted the broad impact of printing, but this recognition has not stimulated an extensive analysis of this phenomenon. The study of the book has been primarily focused on subjects such as manuscript illumination and paleography, bio-bibliographical studies of Hebrew printers, and the censorship of Hebrew books. However, the question of the impact of printing on the transmission of Jewish culture is a major lacuna in the scholarly literature. We cannot hope to fill this gap in the scholarship concerning the history of the Jewish book in this exhibit. We do wish, however, to pose some basic questions: what effects did the printing press have on the transmission of Jewish culture and on a Jew's understanding of his (or her) tradition? How, in other words, did printing change Jewish texts and the use of these texts? The catalogue is also available in PDF (5Mb) form as well as HTML. CLASSICAL JEWISH LITERATURE is replete with references to the nobility of books and, by tradition, books are treated as special treasured objects. When they grew old or frayed, it was deemed irrelevant to throw them out. Old books were either carefully placed in a genizah (synagogue storeroom) or were respectfully interred. Rabbinic literature enjoins Jews to lend books to others, obligates Jewish communities to build libraries, and gives meticulous instructions on the binding, airing, care and preservation of books and manuscripts. Medieval Jewish literature encourages the Jew to make books his companion, to let bookshelves be his gardens: to bask in their beauty, gather their fruit, pluck their roses and take their spices and myrrh. Yet, these very books, upon which Jews lavished so much love and reverence, became the objects of wanton hatred throughout the centuries. As far back as Maccabean times (175-163 B.C.E. ), the Scrolls of the Torah were ripped to pieces and burned by the Syrian Greeks. Except for the attitudes of Christian Hebraists, Jewish books were the object of Christian attack throughout the Middle Ages. They were subjected to frequent censorship and periodic burnings. From 1242, when twenty four cartloads of Rabbinic manuscripts were burned in Paris, down to our own days, when the Nazi Holocaust decimated European Jewry together with its vast libraries, countless Hebrew books were destroyed and many important works were lost. Only a few precious manuscripts and incunabula (books printed before the year 1501) have survived. This sense of irretrievable loss gives special meaning to the assiduous efforts of institutions to collect and preserve the rare Judaica and Hebraica which have survived over the millennia, as the torch of Jewish learning was passed from one center to another, during the long wanderings of the Jewish people. It is with these thoughts in mind, that we cordially invite you to experience a sampling of these Judaic treasures which constitute the true monuments of Jewish history. This catalogue is available for review in the library.